ماتسوموتو, آکیرو. (1387). On Rumi’s Philosophy of Language. 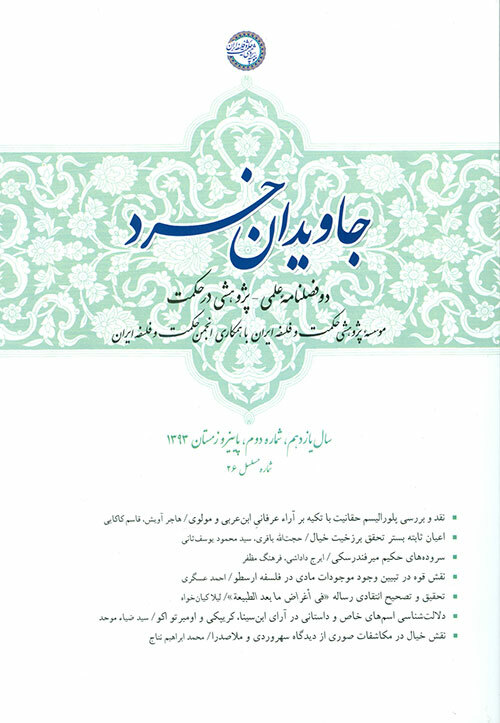 دوفصلنامه جاویدان خرد, 05(09), 39-98. آکیرو ماتسوموتو. "On Rumi’s Philosophy of Language". دوفصلنامه جاویدان خرد, 05, 09, 1387, 39-98. ماتسوموتو, آکیرو. (1387). 'On Rumi’s Philosophy of Language', دوفصلنامه جاویدان خرد, 05(09), pp. 39-98. ماتسوموتو, آکیرو. On Rumi’s Philosophy of Language. دوفصلنامه جاویدان خرد, 1387; 05(09): 39-98. This paper examines the nature of language in the works of Mawlana Jalal al-Din Rumi and consists of three sections: Language and Reality in Rumi; the Complex view of Language in Fihi ma Fihi (the Discourses of Rumi); and, Poetry and Mysticism in Rumi. The paper discusses three main topics: Rumi's ambivalent attitude to language, which is seen as both a means of conveying truth and guidance and yet ultimately inadequate for expressing Divine Realities; the nature of mystical inebriation in Rumi's poetry, and the diverse ways in which this is expressed in the Divan-e Shams and the Mathnavi-e Macnavi; and the intimate connection between imagery and the expression of mystical truths in Rumi's writings. Finally, this paper will show how these three themes are interrelated, giving a complete picture of language in the works of Rumi.